Fixed dose combination (FDC) formulations became popular in the treatment of tuberculosis (TB) because of the better patient compliance, reduced risk of monotherapy and emergence of drug resistance in contrast to treatment with separate formulations of two to four first-line drugs. It has been reported that the poor absorption of rifampicin from combination products may be due to decomposition of the drug in acidic stomach conditions, which is accelerated in the presence of isoniazid The mechanism of this degradation was proposed by Singh et al. 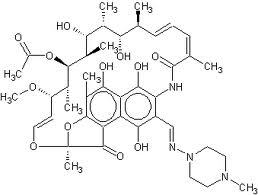 Studies revealed that the decomposition of rifampicin in acidic conditions in the absence of isoniazid stopped at the formation of 3-formylrifamycin, while the reaction in the presence of isoniazid proceeded to form a hydrazone between 3-formylrifamycin and isoniazid. Further, it was suggested that once 3-formylrifamycin is formed, it interacts with isoniazid to form the hydrazone, through a fast second order reaction. As hydrazone are unstable in acid conditions, 3-formylrifamycin and isoniazid are regenerated in areversible manner through a slower first order reaction. In this complex reaction process, rifampicin is further degraded, while isoniazid is recovered. Combination products of rifampicin and isoniazid form isonicotinyl hydrazone (HYD) as a result of the interaction of the imine group of rifampicin and the amino group of isoniazid. While this reaction is slow in a solid state, it increases exponentially in the presence of acid and other tubercular drugs, such as ethambutol hydrochloride and pyrazinamide. The interaction between rifampicin and isoniazid came to light after a pharmacokinetic study of rifampicin in combination products the gastric acid led to a significant degradation of rifampicin, resulting in a 32% reduction in bioavailability Preformulation studies and a forced degradation study can detect such interactions much earlier. Once the interacting component and interaction mechanism is known, a dosage form should be designed that addresses the incompatibility interactions. Several techniques have been proven to give a stable formulation, most of which are based on the principle of physical separation. Major techniques include microencapsulation of drugs prior to its incorporation, multilayered tablets with incompatible drugs added to different layers, and capsule dosage forms with different types of pellets or tablets containing different drugs. A bilayered tablet formulation containing two drugs in separate layers helps to minimize the degradation. INH is a chemical synthetic molecule, a pyridine derivative of nicotinamide. Form and Description : INH is a colourless, odourless, white crystalline powder slowly affected by exposure to air and to light. Solubility : 1 g in 8 g water, 1 g in 50 mL alcohol;slightly soluble in chloroform and very slightly, soluble in ether. A 10% solution has a pH of 6.0 to 8.0. Shelf-life of the substance : Three to five years. Storage conditions : Store in airtight conditions and protect from light. The solution for parenteral injection is a clear,colourless liquid. The pH ranges between 5.6 and 6.0 (B.P. injection) or between 6.0 and 7.0 (U.S.P. It is recommended that sugars such as glucose,fructose and sucrose should not be used in INH preparations because the absorption of the drug is impaired by the formation of a condensation product. Sorbitol might be a suitable substitute. Degradation of rifampicin is pH dependent in presence of isoniazid. At pH around 1 the degradation is minimum and increases abruptly as pH ranges between 2 and 3. Thereafter, above pH 3the degradation is minimal. The pH of the gastric contents is normally between 1 and 3 which results in significant degradation of Rifampicin when administered orally alongwith other anti-tubercular agents, in particular Isoniazid. This problem has been solved by controlling the release or dissolution of both the drugs in such a way that the release takes place at different locations inside the gastrointestinal tract without compromising the total bioavailability of either of the drugs. It means that the two drugs i.e. rifampicin and isoniazid do not come in contact with each other in solution state in the gastrointestinal tract thereby preventing the interaction. The composition may also include other know nanti-tubercular drugs like Ethambutol Hydrochloride and Pyrazinamide. 2. Controlling dissolution of drugs by forming barrier coat and/or matrix with pH insensitive materials such that the contact of rifampicin and isoniazid in solution state is avoided. 3. Using different crystal forms of the drugs such that there is significant difference in dissolution rate of the drugs. 4. Modifying the surfactant action of rifampicin with use of materials like Methylpolysiloxane, natural and synthetic oils. Use of such materials reduces the surfactant action with corresponding reduction insolubility of rifampicin. Preferably the drug is modified such that the release takes place at pH of approximately 5.0. At pH 5.0 the drug release takes place very rapidly such that there is no loss of bioavailability. Whereas the other drug or drugs are released in themore acidic (pH 1.0 3.0) environment of stomach.